I crocheted scrubbies and pins in April of last year for a flower swap at Crochetville. These daisy dish scrubbies were fun to make. I liked the way the cupped petals took shape. I must admit, by the time I got to the third one, I didn’t think I’d ever make it to the last petal! 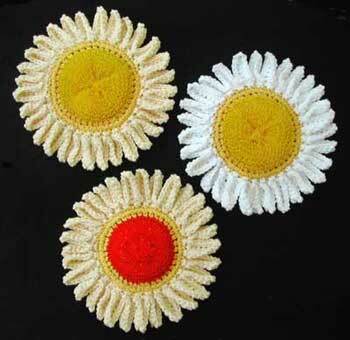 Pattern: Flower Scrubbies (PDF file). (You must logged in to FreePatterns.com to download the pattern. It’s free to join.) Designed by Denise Rothberg, published in Annie’s Favorite Crochet Magazine (October 2002), and now available on FreePatterns.com. Yarn: Peaches & Creme; colors: 10 (Yellow), 3 (Cream), and 1 (White); 4-ply, worsted weight, 100% cotton. It’s funny, I distinctly remember where I bought the plastic scrubbies even though they’d been lying around in my craft supplies for some time: the yellow ones came from a corner grocery at the beach and the red one from a dollar store. The trick was evenly spacing the first round, since scrubbies aren’t always the same size. I used stitch markers to divide them into quarters. Is that obsessive? The one with the red center is my favorite color combo, so it’s getting a close-up. Oh, and how can I not plug the site that helped me find this pattern? CrochetPatternCentral.com, always my first stop for free pattern searching! Whoops, mommy has been paged! (That would be me.) (I’m tellin’ ya, he should’ve slept for at least another 45 minutes!) So I’m outta time for now. I’ll be back another day with the flower pins! Nice to have you back Donna! Those are too cute. I have to try it. i’ve considered these so many times! the ones you did are so cute! too cute for use, i wonder? Adorable! I have printed the pattern! My TO DO list is growing…! Wow! I might actually enjoy washing dishes with one of these in my sink LOL! Those are great! You did a wonderful job. It is nice to see some of your crochet projects. I love the red centered one too! Especially since I’m the one who received it. Thanks again! :) Glad to have you back blogging again. Thanks so much for the link to the pattern! I made a daisy last night and it is a wonderful addition to a dishcloth gift basket that I am donating to my church! Hey, this is sooooo cute! 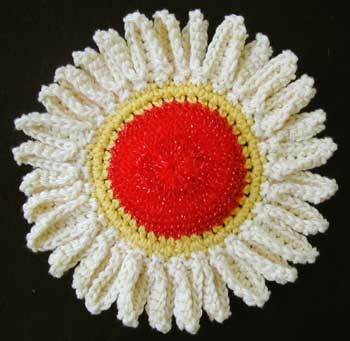 I am going to make up a housewarming basket for a friend who recently lost his home to development, and I just know he’ll love this Flower Scrubby addition. These are too cute.They would look as decoration too.I think I will gift all my friends with these in coming months.Washing up will be easier by having these lovlies in the soapdish.